The Paasche Hobby and Auto Paint Set is a terrific kit that meets the requirements of the hobbyist, ceramist, and auto and cycle customizing buff! 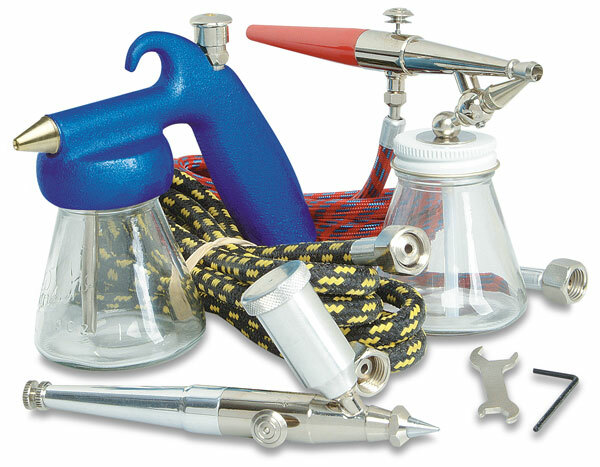 This set includes a Flow Pencil with a 1/32" nib for drawing lines on horizontal surfaces, making dots, and filling grooves; an H-3 Airbrush without accessories, a 6 ft (183 cm) air hose with couplings, a 3 oz (89 ml) sprayer with a 6 ft (183 cm) hose and couplings, and an H 3 oz (89 ml) bottle assembly. A real gem that produces a 2" to 3" (5 cm to 8 cm) pattern and finishes as nice as any you have seen! Sprays glazes, fixatives, medium consistency lacquers, varnishes, and enamels. Use clean, dry, regulated air with pressure ranging from 20 to 45 lb.